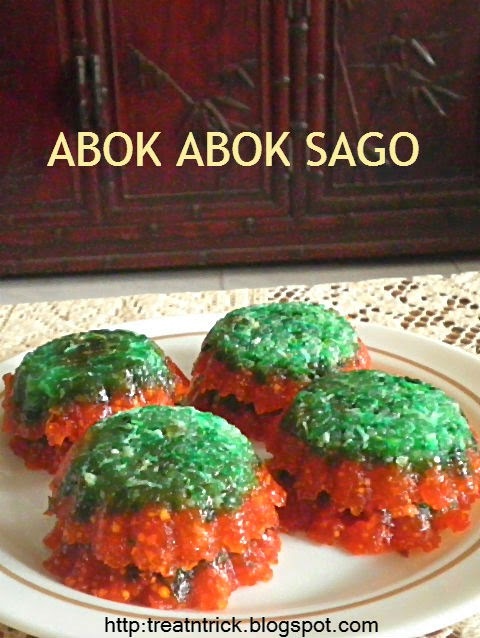 Abok Abok Sago is a traditional Asian dessert normally wrapped in banana leaf made with pearl sago, grated coconut and palm sugar. 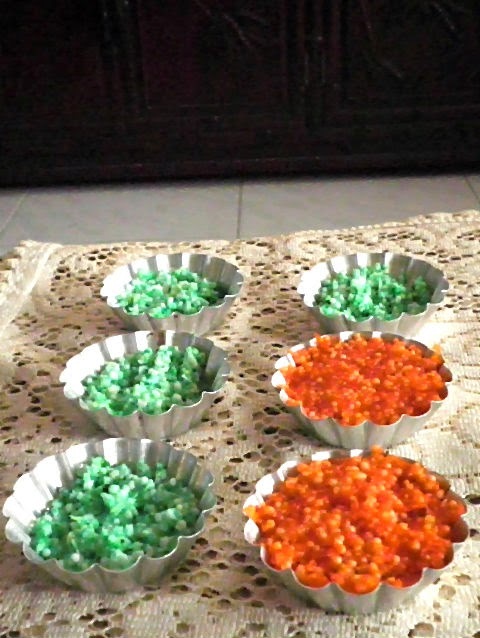 This time this dessert is undergoing a makeover by adding 2 different color, one with green food coloring while other portion was orange (I got this after adding the orange colored sugar) and using small tart mould. You can also make use of jelly mould and changing the color according to your choice. It's fun to see the transformation. This hearty meal of Keema Matar is normally a rich and heavy dish but here we keep it light and fresh by using very little oil and leanest meat either minced beef/lamb or mutton. My son loves to scoop it up with some naan or chapati but it would also be good over rice. Normally it uses various spices such as coriander, turmeric, cumin and chili powder individually but now am using ready made meat masala powder that was available from local market or supermarket. I'm not a big fan for green peas but they were absolutely perfect in this dish. They lend a slight sweetness among the spicy meat and juicy tomatoes. 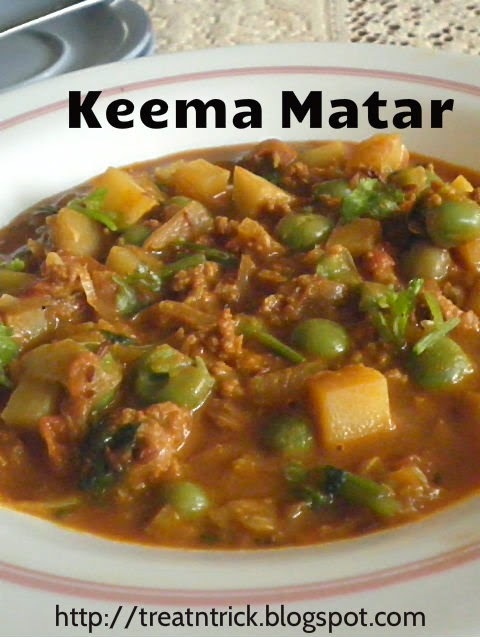 Cubed potato is also included in this Keema Matar. 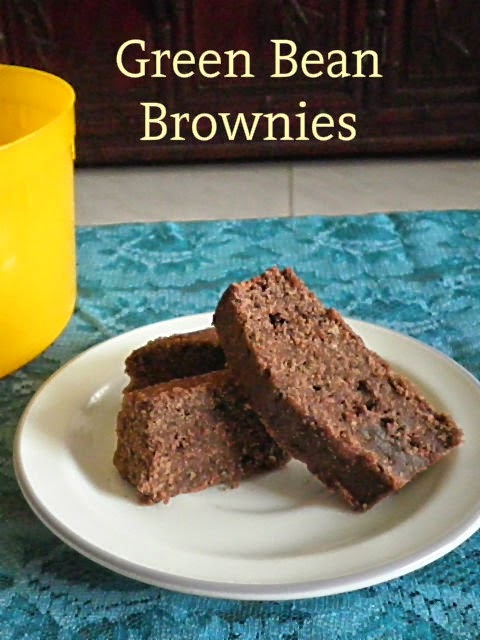 Have you tried making brownies with beans? This might not sound appetizing but give it a try, you'll not be disappointed! 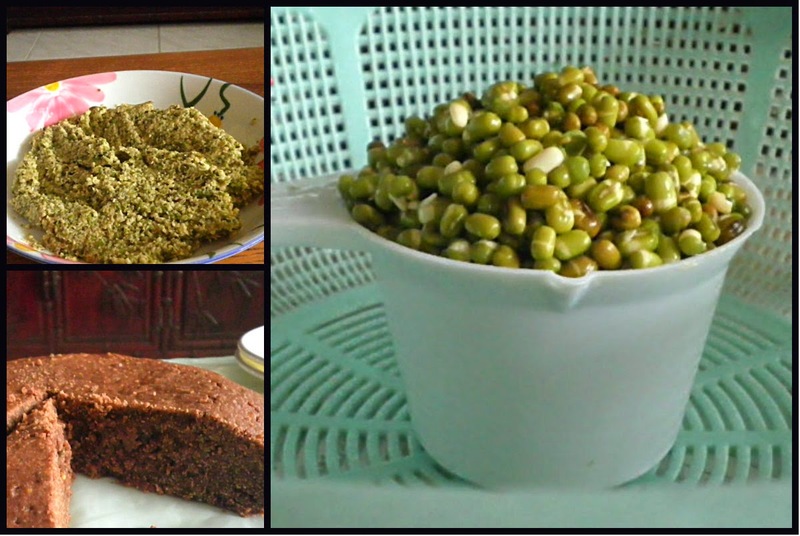 Mostly they used black bean but this isn't available in my pantry so make use of dried green bean aka mung bean. You have to soak the bean overnight, they will expand in volume and easily get 1 1/2 cup of green bean after soaking. Rinse and drain then process them into thick paste. 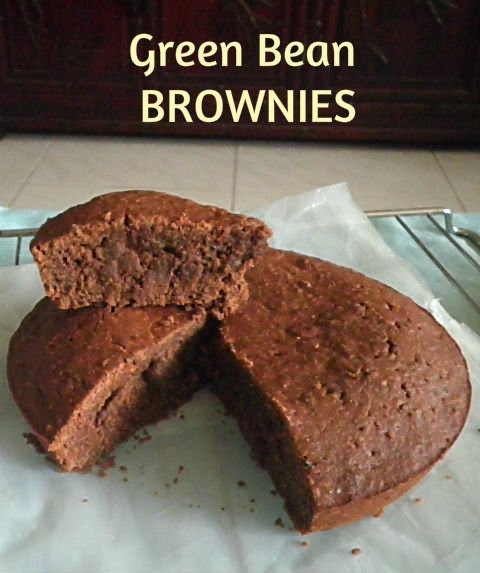 Since this Green Bean Brownies is gluten free, have used chick pea and ground rolled oat but if you have no issue about wheat in your diet, half cup of plain flour and 1/4 cup of corn flour can be used. Also mashed banana can be replaced with 1/3 cup of pumpkin puree or mashed sweet potato. These Green Bean Brownies are rich in fiber and protein but surprisingly no one can tell that it was made with green bean. My family loved them and wanted more after eating them. 1. Rinse green bean then drain. Process in a food processor to become paste. 2. Preheat oven @ 180 C and grease 8 In cake pan. 3. Whisk together both flour, cocoa powder, salt and baking powder. 4. Add in green bean paste, banana, oil/butter and vanilla extract. 5. Stir until well incorporated. 6. Pour into prepared pan and spread evenly Bake for 30 minutes or until a skewer inserted comes out clean. 7. Cool in pan 10 minutes, transfer onto rack to cool. Looking for something indulgent to satisfy a sweet tooth? Look what I have baked today, this is what you might need. These homemade Coconut Bars are filled with soft and chewy coconut topping are a sheer delight. You have an option to add an egg to the dough or go egg free, the choice is yours also for the jam you can choose whatever fruit jam you love. You'll know it is done, when the edges and coconut topping turn slightly brown. 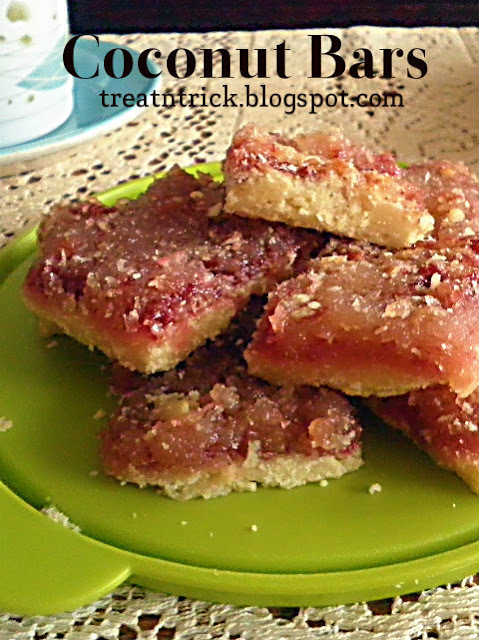 Let cool in the pan before slicing into bars. 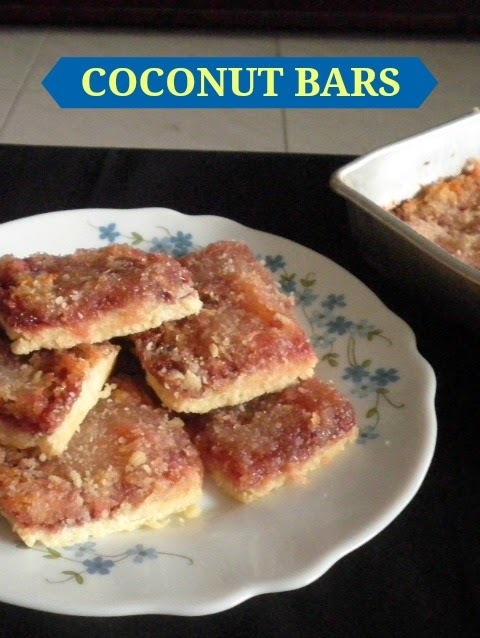 These Coconut Bars will bring a smile to the face of whomever you serve them for sure. Enjoy! 1. Grease lightly 19 x 29 cm slice pan. Preheat oven @ 175 C.
2. Combine topping ingredients, keep aside. 3. Add sugar, egg or milk to melted butter, stir well. 4. 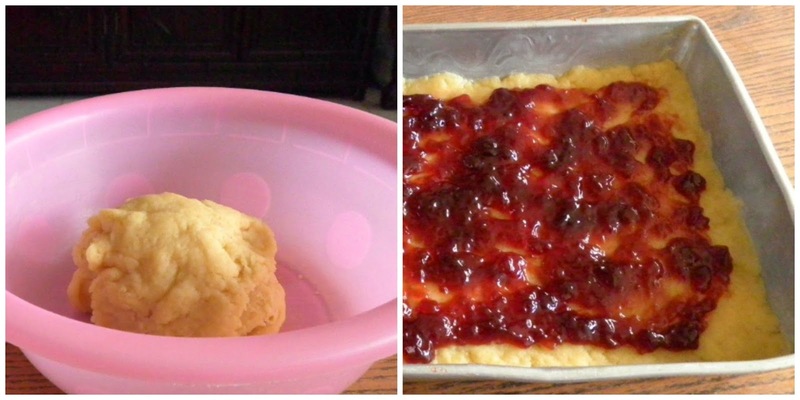 Pour butter mixture over dry ingredients, mix until it forms into soft dough. 5. Press dough into prepared pan using a plastic sheet. 6. Spread liberally with jam. 7. Cover base evenly with topping. 8. Bake until slightly golden for 20 minutes. Kids love to bake cookies. Young kids can practice to measure out ingredients used and stirring them. So tag them along when baking, it is a great learning experience and let them understand the basic kitchen rules. This is a new batch of festive cookies that I baked every year. 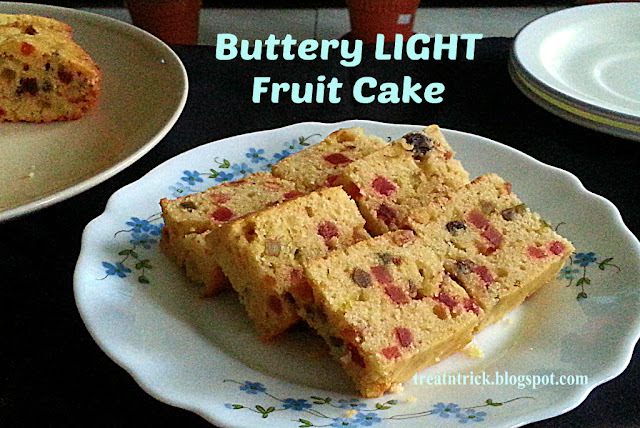 It has a slight crunch to it and buttery too. In fact they are suitable to be eaten anytime, all year round! 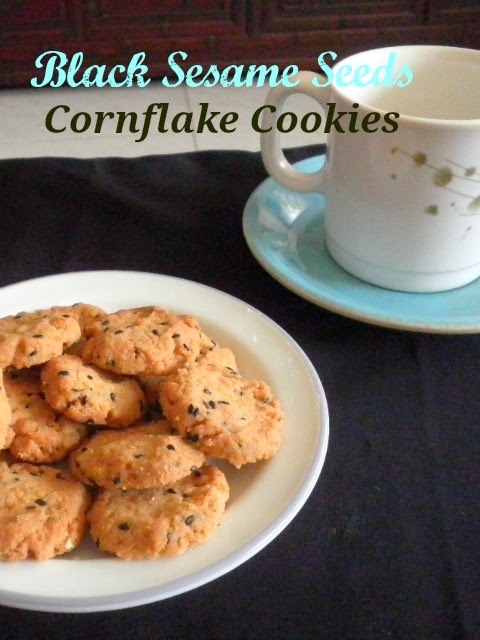 These Black Sesame Seeds Cornflakes Cookies were the first one to disappear from my cookies collection, my whole family can't stop gobbling these little treats whenever it was laid on the table. I have made slight adjustment and turned the recipe into egg free version. 1. Sift flour and baking powder. 2. Cream butter, vanilla and sugar till light and fluffy. 3. 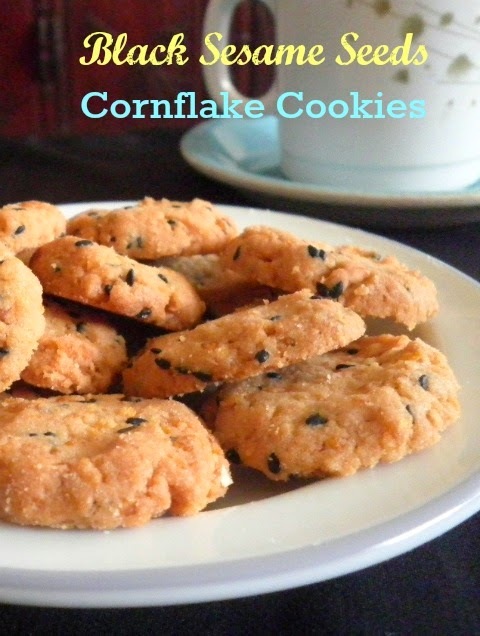 Add in sifted ingredients, cornflakes, black sesame seeds to the butter mixture, combine well. 4. Shape into small balls, flatten slightly and place them on a baking sheet. 5. Bake for 15-20 mins at 170 C until the edges are brown. Cool on pan 5 minutes, transfer onto wire rack. 6. When completely cool, store in an airtight container. 1. Ayak tepung dan serbuk penaik. 2. Pukul mentega bersama gula dan vanilla hingga rata..
3. Masukkan tepung, cornflakes dan bijan hitam ke dalam mangkuk mentega, gaul sebati. 4. Bulat2kan sebesar 1/2 in, leperkan sedikit dan letak atas tin pembakar. 5. Bakar selama 15-20 mins @ 170 C sehingga tepinya keperangan. Diamkan dalam tin selama 5 minit sebelum di angkat dan di sejukkan atas redai. 6. Simpan dalam botol apabila sudah betul2 sejuk. Visit Nora's profile on Pinterest. SUBSCRIBE to get FREE post update! A passionate food blogger sharing my tried and tested recipes on eggless, healthy and easy recipes also household/cooking tips. To know more click THE AUTHOR page. Subscribe To Get Free Posts Update!